This is possibly the cheekiest resignation letter ever! 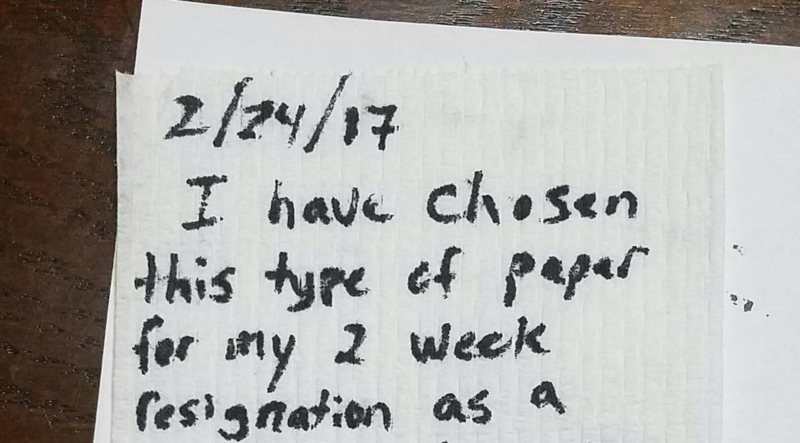 Resigning from a job that you dread is possibly the best and most liberating feeling ever. You spend days trying to conjure up ways to hand that letter in to your boss. After deciding to resign from his miserable job, this guy thought he would let his former employer know exactly what he thought about his crappy job. With a piece of toilet paper and what looks like eyeliner or a black marker in hand, he penned down his very honest thoughts to his ex-boss. Do you believe in a handing in a cheeky resignation letter or should it be a simple straightforward one? Share your comments below.